You'll never look at a novel the same way again! The Notice and Note signposts help readers learn when to stop, think and respond to critical points in a text. Our product is a Novel Study Guide based on the Notice and Note signposts using the book The War I Finally Won by Kimberly Brubaker Bradley. This is a test on the book The War I Finally Won by Kimberly Brubaker Bradley. You can also find this test in my Quiz Bundle and Unit Bundle. This is a quiz on chapters 5-8 in the book The War I Finally Won by Kimberly Brubaker Bradley. You can also find this quiz in my Quiz Bundle and Unit Bundle. This is a quiz on chapters 9-12 in the book The War I Finally Won by Kimberly Brubaker Bradley. You can also find this quiz in my Quiz Bundle and Unit Bundle. This is a quiz on chapters 33-36 in the book The War I Finally Won by Kimberly Brubaker Bradley. You can also find this quiz in my Quiz Bundle and Unit Bundle. This is a quiz on chapters 37-40 in the book The War I Finally Won by Kimberly Brubaker Bradley. You can also find this quiz in my Quiz Bundle and Unit Bundle. This is a quiz on chapters 45-48 in the book The War I Finally Won by Kimberly Brubaker Bradley. You can also find this quiz in my Quiz Bundle and Unit Bundle. 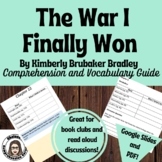 This bundle includes quizzes for the book "The War I Finally Won" by Kimberly Brubaker Bradley. Each quiz covers 4 chapters of the book. The quizzes are also sold separately, but you can save $5 by purchasing as a bundle. That's like getting the comprehension test free! This is a quiz on chapters 1-4 in the book The War I Finally Won by Kimberly Brubaker Bradley. You can also find this quiz in my Quiz Bundle and Unit Bundle. This is a quiz on chapters 17-20 in the book The War I Finally Won by Kimberly Brubaker Bradley. You can also find this quiz in my Quiz Bundle and Unit Bundle. This is a quiz on chapters 21-24 in the book The War I Finally Won by Kimberly Brubaker Bradley. You can also find this quiz in my Quiz Bundle and Unit Bundle. This is a quiz on chapters 25-28 in the book The War I Finally Won by Kimberly Brubaker Bradley. You can also find this quiz in my Quiz Bundle and Unit Bundle. This is a quiz on chapters 29-32 in the book The War I Finally Won by Kimberly Brubaker Bradley. You can also find this quiz in my Quiz Bundle and Unit Bundle. This is a quiz on chapters 41-44 in the book The War I Finally Won by Kimberly Brubaker Bradley. You can also find this quiz in my Quiz Bundle and Unit Bundle. This is a quiz on chapters 49-52 in the book The War I Finally Won by Kimberly Brubaker Bradley. You can also find this quiz in my Quiz Bundle and Unit Bundle. This is a quiz on chapters 53-56 in the book The War I Finally Won by Kimberly Brubaker Bradley. You can also find this quiz in my Quiz Bundle and Unit Bundle. This is a quiz on chapters 57-60 in the book The War I Finally Won by Kimberly Brubaker Bradley. You can also find this quiz in my Quiz Bundle and Unit Bundle. This is a quiz on chapters 61-63 in the book The War I Finally Won by Kimberly Brubaker Bradley. You can also find this quiz in my Quiz Bundle and Unit Bundle. Signpost Bundle! The War that Saved My Life & The War I Finally Won!